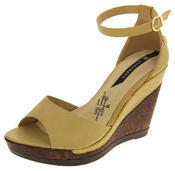 These gorgeous strappy sandals are the newest addition to the extensive Rocket Dog summer footwear collection. They have a chunky 4 inch high heel and a 1 inch platform sole. They have an ankle strap with adjustable buckle fastening and elasticated tab to ensure a perfect fit.